I began 2019 by watching the dawn gently wash over the Prime Desert Woodland Preserve in Lancaster, Calif. It was the best way I knew to celebrate the year ahead as the artist in residence for the preserve. 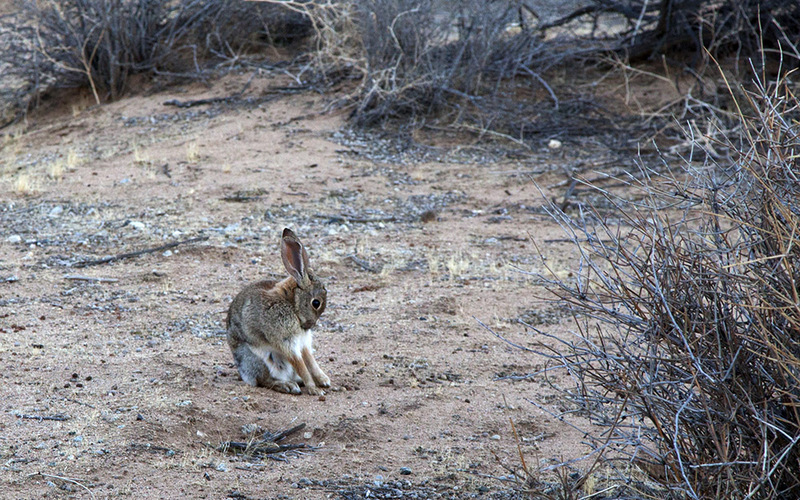 In the dawn hours, I saw more than a dozen rabbits hopping along the trails. As I quietly watched, this one groomed herself. Rabbits hip-hopped across the trails, hawks soared in the sky, and the light gently shifted from blue to gold in the morning chill. Joshua trees glowed in the sun’s early morning rays, and people who ambled the trails wished each other a good morning and happy new year. I can’t imagine a better way to begin a new year. My name is Dani Dodge. I’m an artist who lives in Los Angeles with a deep love of nature and the desert environment. I first visited the preserve in 2017 as part of a community engagement project with the Museum of Art and History. It was love at first sight. To have a Preserve of 130 acres in the middle of a residential area is extraordinary. To have it be so pristine? Unbelievable. Birds soared in the air above the preserve. Over the next 12 months, I will lead art activations in the preserve, continue to document my experiences through photos and words in this blog, and create an art exhibition inspired by my experiences here. By the end of my residency, I hope to learn to recognize the birds by their calls and be able to name the flora and fauna I pass on the trails. I will travel each of the three miles of trails and find the extraordinary moments of beauty in each, and share them with you. In future blog posts I will explain how this residency came to be, lay out the schedule of the art activations, and highlight opportunities for other ways to interact with art and the preserve in Lancaster. Stay with me. Let’s make 2019 a thing of beauty together at the Prime Desert Woodlands Preserve. As the sun came up, the shadows stretched across the desert preserve, capturing me in the act of recording the beauty.